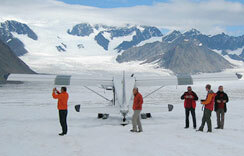 Charter flight services tailored to mountain climbers. Climbs that begin from Kahiltna Glacier Base Camp, including summiting Denali (Mt. McKinley), Mt Foraker, Mt. Hunter and other popular climbs. 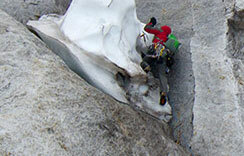 Get away from the crowds and get some world-class climbing around the head of Ruth Glacier. Sheldon Air Service strives to be the best in climbing support. Little Switzerland is a rising star in the world of climbing. Let us take you to this hidden gem. Climber Friendly: Sheldon knows the process, the dangers and the rewards of mountaineering. Whether you are planning a typical summit attempt on Denali itself or want a custom expedition planned and supplied for any of the many intense to moderate climbs in the Alaska Range, your first step towards a successful attempt is to consult with Sheldon Air Service. If you're getting ready to do some climbing in Alaska we've put together some information to save you time and headaches for finding the things you need for a safe successful climb. 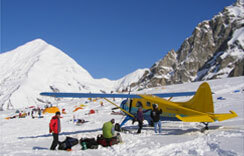 No one knows Denali Expedition support like Sheldon Air Service. Bob Reeve and Don Sheldon invented it. David Lee and Jok Bondurant are the two most experienced mountaineering support pilots in the business. Our Cessna 185 or DeHavilland Beaver can put your party into some of the most demanding and remote base camps imaginable, throughout Mt. Mckinley and the Alaska Range. For the larger expedition we can combine the two planes for a formation flight to begin your trek to the top. Simply the best: Mountaineering Denali is not trivial. You've planned the expedition, trained hard and invested time and equipment to ready yourself to climb the tallest mountain in North America. Make sure the linchpin of your expedition is solid. Contract the most experienced mountaineering support air service in the business and give yourself the luxury of knowing your air logistics will be handled efficiently, on schedule, and within budget.